My watercolor "Reflections" was awarded the Crimson Atelier Prize at the 65th annual New Jersey Watercolor Society Open Juried Show, which is being held at the Monmouth Museum until October 28th. Windpower - Historic Finnish windmills. These are three 9x13" watercolor sketches of windmills on the coast of western Finland. My watercolor, "Elm Street", showing a group of buildings in South Thomaston, Maine will be included in the North East Watercolor Society, 31st Annual International Open Exhibition 2007, which will be held the last two weeks in October at The Gallery at Kent Art Association in Kent, Connecticut. My painting of a street and firehouse at Canterbury Shaker Village, NH will be part of the Pascack Art Association annual member show to be held at the Hillsdale Public Library during October. The watercolor is part of a series on Shaker Architecture, in which I have been interested for many years. My watercolor painting "Reflections", of four fishing boats in San Fransisco Harbor is now showing at the Monmouth Museum in Lincroft, NJ, until the end of October. 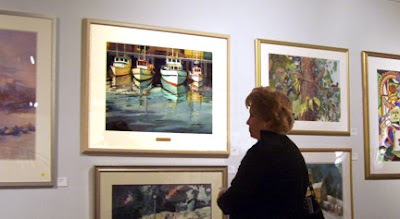 It is part of the New Jersey Watercolor Society 65th Annual Open Juried Exhibition, in which paintings by artists from all over New Jersey are chosen for exhibition by a jury of renowned artists. The framed painting is 30x39". It is listed at $1,500 and can be purchased at the show.